It’s just beginning to get a little brighter and warmer outside, and for many, the snow is also beginning to melt away. This can only mean one thing—spring is coming. Preparing your lawn for spring can be quite the task, but John Deere lawn tractors have been helping since the 1960s. When the John Deere Lawn Tractors were first introduced, they began helping individuals improve the appearance of their lawns with ease. Since then, we have also seen the addition and evolution of many attachments, creating optimal results for your yard—especially in the springtime, when lawn care is essential. During the course of the winter into early spring, this equipment needs to be maintained so that it is up and running perfectly for when the spring begins. In addition to great equipment, it is also important to follow some early spring lawn care tips in order to get that aesthetically-pleasing, bright green grass. John Deere Lawn Tractors have been on the market since 1962. Since then, there have been hundreds of models introduced to homeowners, landscape professionals, and farmers alike. Let’s take a look at some of the most popular lawn tractors, broken down by the decade they were introduced in. At the beginning of the 1960s, lawn mowing was becoming increasingly popular—prompting John Deere to introduce a lawn mower—similar to those that large farms were using. That model was the John Deere 110. This model had a 4-stroke petrol-fueled engine with 7 horsepower. It was also designed and maintained features that would have been considered before its time—making it extremely popular. After the 110 model, John Deere introduced the smaller 60 model, as well as the 112 and the 140 models. These John Deere lawn tractors were much smaller and more compact—and were all created with the urban customer in mind. This is also where we first saw attachments being created for said lawn tractors. In 1984, Deere introduced its first tractor to combine a diesel engine with hydrostatic drive and power steering—called the John Deere 430. They also developed the 300 series more deeply in addition to launching the R and S Series. The 300 series was redesigned into the 318 model. This model was extremely popular because while it had many new features and design benefits, it could also still use the attachments from previous models. On the other hand, the R and S models were introduced so that there were more options depending on the size of the farming operation. In the 1990s John Deere launched the LT, LX, GT and GX model series. All of these models were created for the purpose of building a great customer experience. In addition, these models were built to ensure the machines lasted longer than ever before. In the 1990s there was another landmark event that occurred for John Deere lawn tractors. They hit both the 2 million and 3 million milestone—manufacturing their 2 millionth lawn tractor with the LX188 model and their 3 millionth tractor with the LT133 in 1998. Deere made updates to existing models in the 2000s. This saw an increased focus on offering more power to customers as well as the increased size of machine. This is also when they launched the LA and X series—both of which utilize cutting edge technology to improve convenience, performance, and reliability for these John Deere lawn tractors. When the snow starts to melt, landscaping and planting start to become a priority again—and that involves a lot of steps to great lawn care. 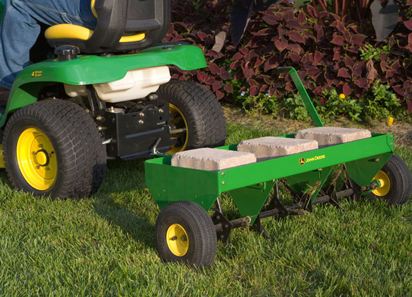 Maybe that begins with additional snow removal, aerating the ground, or picking up extra debris—but did you know that you can complete many of these steps by using John Deere lawn tractor attachments? Let’s take a look at some of these attachments, as well as their use during the spring season. A Hydraulic Tiller: A Hydraulic Tiller is great during the spring because it is used to prepare seedbeds and control weeds in a wide range of terrains to prepare for planting. This specific attachment breaks up dense soil, making it the perfect growing environment—especially while the soil is still partially thawing from deep freezes of winter. 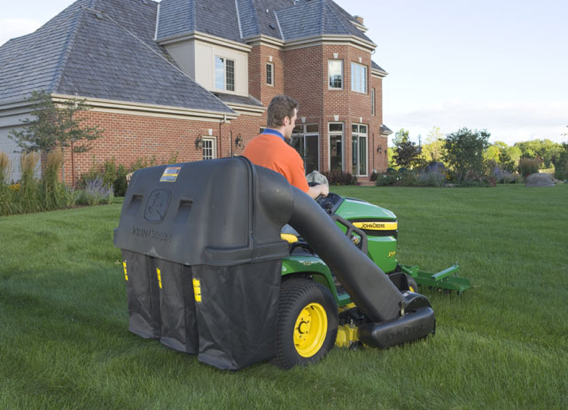 John Deere Bagger: John Deere Baggers are used to quickly pick-up debris—keeping a uniform lawn appearance in the spring when everything is beginning to grow back again. This being said, bagging is a solution that avoids dispersing weed seeds or diseased clippings. Snow Blower: If you live in an area where it is very cold during winter, snow can still fall into as late as early spring. These snow blower attachments can be used across different John Deere models—so you can ensure your driveway and walkways are cleared and safe to walk on. A Mower Deck: Mower decks can help to keep your grass looking great, as they disperse clippings evenly for a finished appearance. Mower decks are great for the spring because they provide excellent cut quality, higher productivity, and clean operating—all of which can be hard to achieve during the beginning of spring. These mower decks can be used across many John Deere models. Weather Enclosures: For the D100 model (amongst others), there is an attachment that protects you, as the user, from any unpredictable weather. Whether it be “April showers” or bright, direct sun, you will not have to worry. Grass Groomer: For X700 (and other) tractors, there’s a grass grooming attachment, which can help to give your lawn a brand new look this spring. It also comes with a lawn striping kit, which makes implementing patterns easily. MulchControl: This attachment is helpful if you are on the fence about mulching or bagging your grass clippings. With the MulchControl attachment, all you have to do is flip a switch, and you can go back and forth between the two. You may know that you have to put quite a bit of work into your yard during early spring to ensure it will look great through summer and fall—but did you know that you also need to prepare your lawn equipment before you start using it as well? Here are the steps you should take to safely get your lawn tractors ready for use. Check Your Air Filter: Lawn mower users may not notice a dirty filter—which is often the cause of lost power and wasted fuel. Eventually, a dirty air filter will make starting your lawn mower more difficult and could even cause the engine to overheat. This can be very dangerous for users, so this step is crucial. Change Your Fuel Filter: Like air filters, fuel filters also get dirty and could result in the tractor to lose power. It’s suggested these filters are changed once a year, and spring is a perfect time since maintenance will already be occurring. 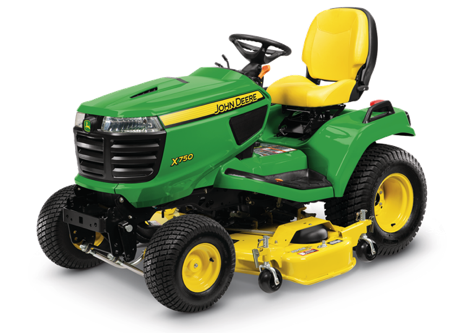 Pay Attention to your Mower Deck: While the lawn tractor itself has full-year versatility, every spring, the mower deck should be removed and reattached. It should also receive proper attention—including a replaced drive belt, blade, and proper mower deck lubrication—if necessary. This helps to not only keep your yard looking as pristine as possible, but also keeps the riding mower in good condition—so it can last a long time. By utilizing an aerator attachment, you open up the soil so that the plants have the ability to breathe and grow during the spring. This allows not only oxygen to enter through the soil, but it also allows water and proper nutrients to reach the roots. While using an aerator alone helps plants get the nutrition they need, actual physical fertilizer will also help to do the trick. Feeding the lawn with fertilizer only furthers the plant’s ability to grow. It replenishes the reserves used by the soil during the winter. That being said, to get the most out of your fertilizer, it is important to find one that matches the pH levels and natural conditions of this soil. The first grass cutting of the season is going to be the most crucial. During the winter, many lawns were heavily deprived of sunlight, which means they may not be looking their best come early spring. There are a few steps you will want to follow during this first cut—so your lawn gets the jumpstart it needs. Pre-Cutting: Before you cut your lawn, all debris should be cleared, and the grass should be between 3 and 4 inches in length. It should also be dry to touch. This helps to ensure an even cut, and that none of the debris gets stuck in your lawn mower. During: While cutting your lawn, you will want to make sure that you only take about ⅓ of an inch off of the top. This promotes the growth of healthy grass. Post-Cutting: Once the first cut is complete, you will want to continue to maintain the desired length of the lawn—which may involve mowing once or twice a week, depending on how fast the grass is growing. Bagging is a method which keeps a clean and consistent look during the busiest time of the cutting season. It removes any diseased clippings or weed seeds from the property and reduces their chances of spreading elsewhere. While this can be great in some circumstances, mulching is also a method used by many. Grass clippings are one of the most underutilized forms of fertilizer. Instead of throwing out these grass clipping, they can actually be left on the lawn, where they break down in less than two weeks. This is called mulching and it cuts down on the amount of yard waste filling up the landfill and is beneficial to your lawn. In terms of mulching versus bagging during spring clean up, there are a few different things to consider. There are benefits to both, but no matter how you are feeling, John Deere lawn tractors come with a MulchControl option, where you can switch the bagging on and off. Sunlight helps the grass to look extra green, although this can not necessarily be controlled. Depending on where one lives in the country, the general period is either April-through-June or September-into-November for the best grass. The sunlight will not only impact the color of the grass but the rate at which it grows, as well. 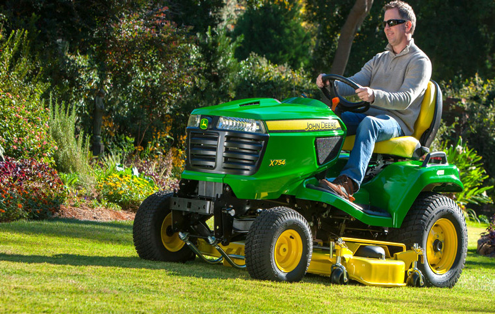 Getting ready for spring can be a hassle with all the debris clean-up and attention necessary to create the idealistic lawn—but not with John Deere lawn tractors and their attachments. With a history in lawn tractor excellence, as well as cutting edge attachments and technologies, your lawn will be looking great in no time.